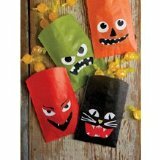 The coolest easy halloween crafts for kids, that cost next to nothing or are completely free kids crafts. Take a quick look over these toddler crafts below and find one to get you started. click on the image to take a look. When your child gets involved with any toddler craft activities they should be supervised at all times. In many craft activities for kids there are many small parts. If your toddler is left unsupervised they may put these in thier mouths. Which could lead to swallowing and possibly choking. So better to be safe and only organize these easy easter crafts for kids when you can watch over them. These are not strictly easy halloween crafts for kids but are one of the most popular toddler activities going so I thought I would add them here. They just seem to love coloring with crayons and pencils. So let them loose with these free halloween coloring pages. There are witches, pupmkins and other pages just waiting to be colored in. This halloween craft activity is really for mom or dad to do. You will need a sharp slim craft knife for creating your scary halloween pumpkin face. Next ask your toddler to put a tea light candle into the bottom ready for lighting once it gets dark. A tip is to put some small holes in the lid to let out the heat from the candle. I use a metal cooking skewer to make my holes. If you want to carve a scary pumpkin face the neighbours will be so envious of, then use the pumpkin masters kit justto the right. These are easy halloween crafts for kids to get involved with. 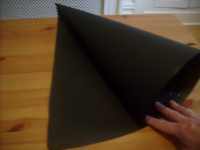 you will need to do the cutting on this one but they can decorate thier witches hat when it has been put together. 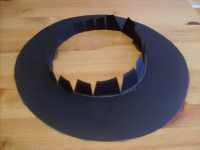 You will need to draw an arc for the base shape on the mian part of your witches hat. 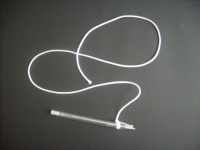 As in the picture hear I just tied a length of thin cord to the tip of my pen. I found the center on the long side of one of the pieces of thin card. I marked it then held the cord at this point while pulling the pen. Keeping the cord under a little tension. Then with the pen near the bottom of the card I made an arc using the pen. Next I marked a line with my pen from the top center point down at a diagonal to the edges of the card where the bottom curve met the sides. 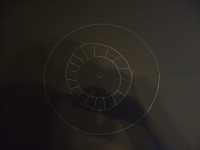 Then I cut along the bottom curved line as in the picture here. Now continue cutting along the two straight lines that meet at the top center. For the next step you will need the assistance of your toddler. Start by wrapping one half around the head of your child. Then carefully holding the card in place, take it off your childs head and use some sticking tape or strong glue to fix in place. >Now finish by wrapping the otherside around and glueing or sticking in place. I usually just use sticking tape as it holds quicker. I add a few tabs of sticking tape all along the edge. 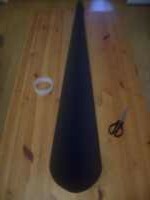 Now you have the cone of the witches hat finished you need to complete the brim of the hat. 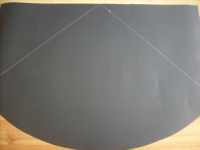 This picture shows the circles need to create the brim of your witches hat. I placed the cone I just made onto the blank card and drew a line around it. Next I drew another circle freehand about an 1 1/2 inch inside this circle. Then I drew lines between the two circles (the picture below shows why). 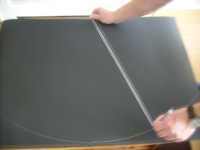 Then I drew a large circle using my pen on the cord. This circle is about 3 inches wider again. 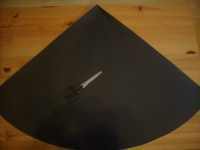 This picture shows how the brim of the witches hat looks when cut out ready for fixing to the cone. Now the brim of the hat is fixed inside the cone using the little tabs on the brim. You can glue or tape these into place. 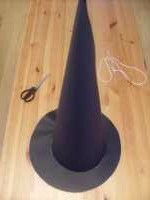 There you have it quick and easy halloween witches hat that any one can make. Now all that is required is for your little one to add the decoration. 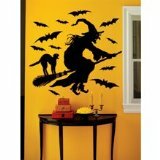 Why not get one of these Martha Stewart Halloween Witch Wall Cling to create the right atmosphere and get everyone in the right mood. These are really easy halloween crafts for kids. 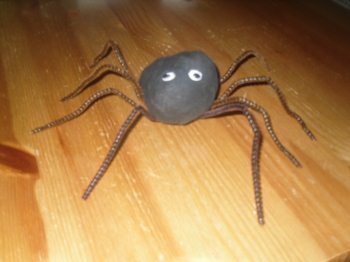 A scary spider made with some old black socks tucked into a ball. Next glue some legs onto the bottom of your spider body. I used dark brown pipe cleaners for the legs. Then finally get your toddler to glue on the eyes to finish making this scary spider. You can bend the legs into shape to make it look more real. 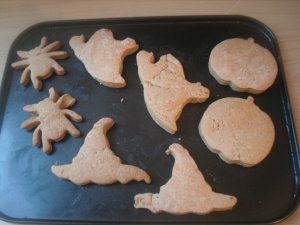 Why not have some fun with your little one baking halloween cookies. In the picture above we made these pumpkins, witches hats, spiders and ghosts using halloween cookie cutters we bought on ebay. As you can see here below they cost very little but the kids just love using them to make their own cookies with. Important note: All toddlers learn from doing with a little guidance. So let your little one be creative and take the lead as much as possible with these easy halloween crafts for kids. Let them cut out their own things even if they struggle. Let them draw their own interpretation of what they think the picture should look like. They learn so much from trying new things and experimenting. I hope you liked these ideas for easy halloween crafts for kids.